Brick Wall 3 Of Four by Walter Neal - 8.000" x 5.375"
Brick Wall 3 Of Four art print by Walter Neal. Our prints are produced on acid-free papers using archival inks to guarantee that they last a lifetime without fading or loss of color. All art prints include a 1" white border around the image to allow for future framing and matting, if desired. I see we share a love and awe for the Inner City experience. The uniqueness and transparency of elements that have evolved and far surpassed brick and mortar. I often wonder does everyone feel the spirit of the life and vibration of the seemingly discarded. I can say now that I am not alone. 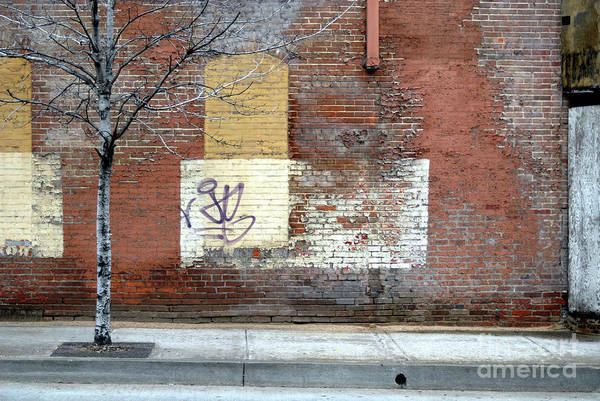 A photograph, taken in Baltimore City, Maryland, of a decaying brick side of a building at street level.